A delicious Chinese treat that will bring a smile to your face! Delicious fatty pork, browned eggplant, a thick tasty sauce that covers everything. Add some steaming hot rice and you are ready for a Chinese feast! Eggplant, also called aubergine, has a surprising meaty quality. So whenever you feel like skipping meat once in a while, eggplant is the perfect alternative. Or just go for double trouble and use eggplant in combination with meat like in this recipe. Pork belly is a traditional staple in different Asian kitchens. It’s nice and fatty, maybe even too fatty for some people. You can substitute it easily with minced pork if you don’t like that much fat in your food. First, halve the eggplant lengthwise, then cut into slices (about 1cm thick). Finely dice the garlic. Cut the pak choi into very thin slices, the green leaves as well as the white stem. Slice the spring onions and chili pepper at an angle into thin rings. Dice the pork belly into 1 cm cubes. Put a skillet with high rim onto high heat. Add the oil to the skillet and fry the eggplant slices until golden brown on all sides. Transfer cooked eggplant to a plate. Place skillet on high heat again, add the pork belly cubes, diced garlic, ginger and chili pepper. Stir fry for about 5 minutes until the pork belly browns and gets crunchy on the edges. Add the chicken stock as well as chili sauce and bring to the boil. Insert the sliced pak choi and the cooked eggplant including all their juices. Add rice vinegar, dry sherry and sesame oil. Stir to combine and let simmer for another 3 minutes. In the meantime combine the tablespoon cornstarch with 2 tablespoons of cold water into a paste. Add the starch paste to the skillet, insert sliced spring onions and stir until the sauce of your dish thickens. Serve your delicious pork belly with some steaming white rice and dig in! Let me know in the comments what you think of the recipe! Do you love eggplant as much as I do? 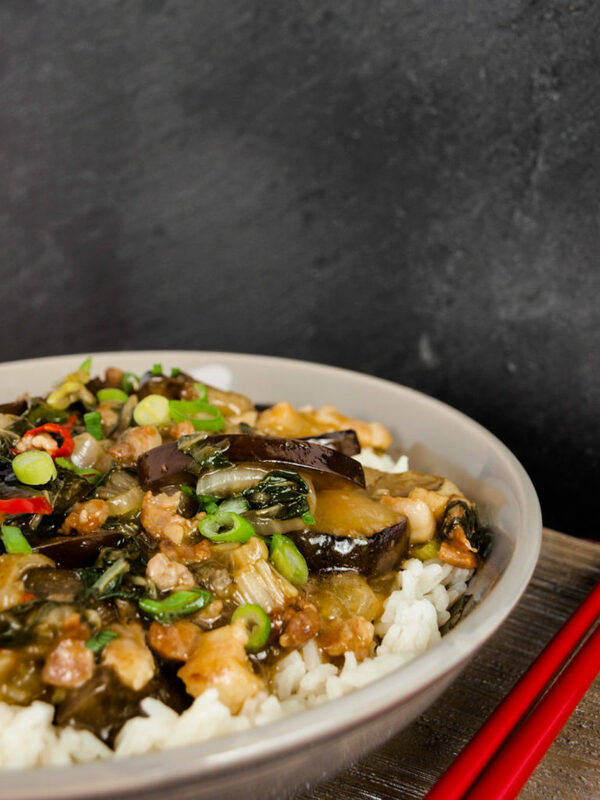 Have you ever had real Chinese eggplant with pork and think this recipe is missing a key ingredient? Leave your comment and help to make this even better! Next Post Taking a leap of faith and cooking with pure science!